Ah, spring. Well, not really, but it’s been in the 70’s the last few days in Dallas so I figure it’s a great time for spring cleaning. 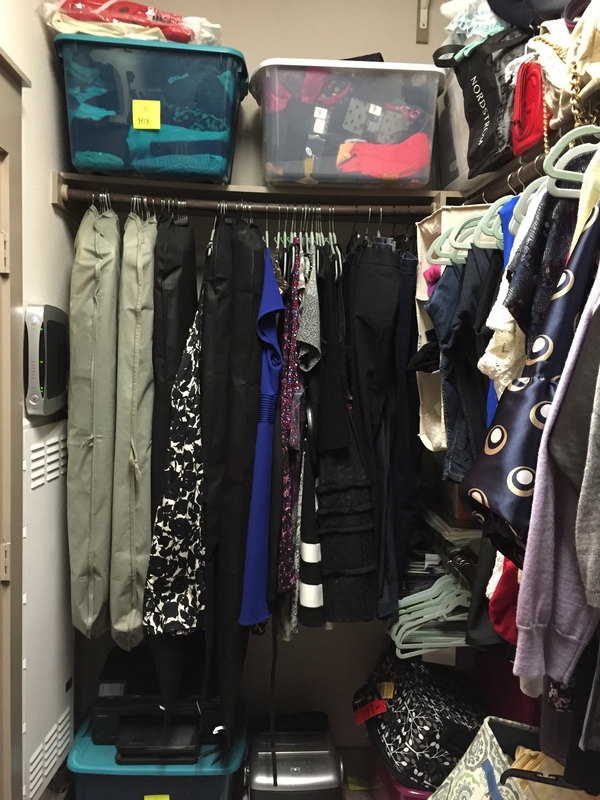 There is nothing I love more than an organized closet. Well, besides a five pound drop on the scale. That’s better. Whenever I have a chance to get my hands on someone’s closet, particularly my mom’s, I’m a happy girl. Even just grouping like items together and organizing by color pleases me. 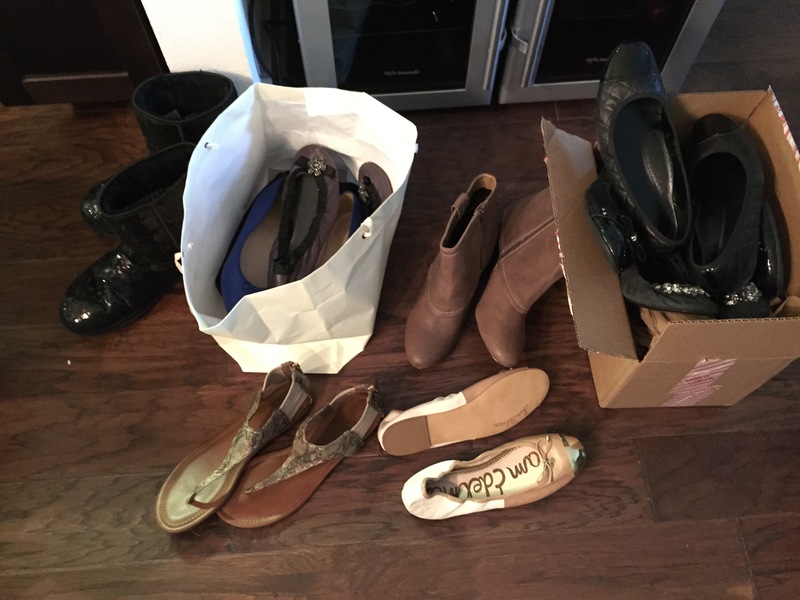 Sidebar – Colleen, move back to the States so I can clean out yours again! Saudi won’t let me have a visa for organizational purposes. Rude. 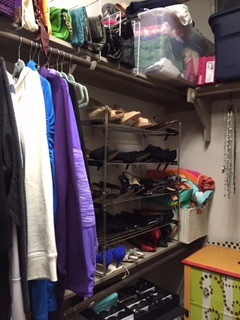 If I could make a living doing closet organization, I totally would. Unfortunately, you can’t make someone you don’t know very well strip and try on that one piece of clothing that they just can’t get rid of like you can your mom and your best friend. Sometimes they just need to see that ten year old shirt in the mirror. Anyhoot, I currently have six totes of unwearable clothes in my closet, plus mom and I have a pretty solid hoard at her house. We’ve been a lot of sizes in the last five years, and we learned the hard way to keep the good stuff and donate the rest. This goes for lingerie, swimwear, happy pants and workout gear too! That’s why I have so many totes – my bras simply just take up a lot of space. It’s not because I’m a hoarder. Really. I like the theory that you won’t climb back up the scale if you don’t have any clothes in that bigger size, but honestly, you just end up wearing too-tight clothes and feeling bad about yourself. I try to keep anything I can’t currently wear out of rotation, because there’s nothing worse than being frustrated in the morning when you are trying to get out the door. I’m proud to say I’m finally back in the middle, and an owner of two bigger size totes. May I never see you again, and let’s be honest – I’ll never be able to eat the way I used to, so I really shouldn’t ever gain that weight back. The three totes in the pic below are my smallest size. The tote on the right is the hoard of lingerie and hosiery, thanks to my buying office time and way too much wishful thinking on my part. That fabulous splash of coral is the swimsuit I wore for 2009’s spring break in Puerto Rico! I’ll get back in it eventually, hopefully by this summer. Note that my printer is sitting on the bottom left tote, and it’ll be there for 40 more pounds. I’ve got time. Maybe I should rethink that pizza I ate for dinner. Garment bags are your friend for dust free too small hanging clothes and the totes on the right (tucked behind the handbags) are full of clothes that are too big. That’s a great feeling! It’s the stuff I wore all last summer, so it’s been stashed for seasonal inappropriateness for a while. I’ve been adding to it over the past couple months, mostly when I try to wear a favored outfit and realize it looks sloppy. That’s mostly okay if I’m at home wearing happy pants, but truly, I prefer a fitted v-neck for those occasions too. I have my vanity. As I tried to pull down the middle sized tote this afternoon, which I’m probably within ten pounds of easily wearing, I found myself kicking some shoes out of the way. Slippers, stray contraband J Crew flip flops (the ones that ruin floors), sneakers that are kicked off immediately after the gym, my over the knee boots, etc. No excuses, really, because look at these great shelves! 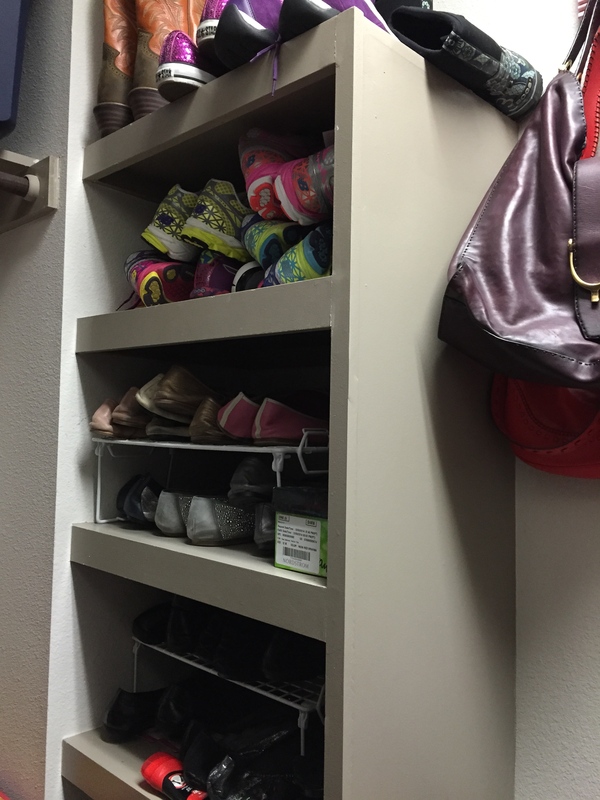 Built-ins hold my sneakers, colored flats, black flats, sandals and two baskets below hold flip flops and other sandals. Heels and booties on the metal rack. Out of season shoes in yet another tote. Oops. I know it’s a lot of shoes, but a girl needs patent and regular black pumps, plus an option for peep toes and winter. And the bright blue suede pumps were an easy gimme. It’s not that easy finding great shoes in a size 12, and some of these I’ve had for eight + years. Classics rarely go out of style, and I haven’t worn heels in about 40 pounds, so there you go. Plus I worked in fashion for over ten years. These things happen. I did manage to find a solid stash to sell on eBay. The app makes it so easy – approximately two minutes to post per pair. Love it. My eBay store is active 2-3 times a year, and my username is caleeksu5. If you have a flipper-feet person in your life that needs some shoes, send them my way. And by person I do mean either gender, because as some of you know, about 75% of my shoe sales are shipped to men. Hey, I ain’t judging. Get your sparkle on, girls and gurls! I know I’m just one MAC eyelash strip from looking like a drag queen too. I’m looking forward to going through that middle sized tote tonight – snagging some smaller workout gear, smaller pajamas and drawers. I bought new lingerie this past week, and while Valentine’s Day is a great time to be shopping for such things, I know I’ve probably got plenty stashed away. Heaven forbid I miss a semi-annual sale. I’m sure there are all sorts of things with tags still on them in those totes that I fully intended to get into by the end of the month, or end of the season. I’ve stopped doing that, btw. Buy things that fit today, not that will fit tomorrow. Even if you’re doing it on deep clearance, 70% off plus an employee discount. Totally not worth the closet space! There will always be a good sale when you’re truly ready for something new 🙂 And I plan to use this eBay cash to get it. < Previous Pizza, Pizza! Without Gluten or Cheese. Sigh. Wow, must’ve taken you a long time to decide to clean up and sell your shoes! I love buying stuff on a whim/on sale/just because and even if I end up with a lot it is still hard to see my stuff go!